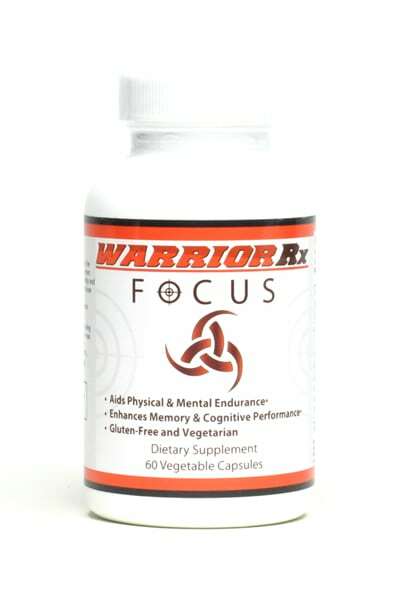 WarriorRx Focus is an all-natural daily supplement for improved focus, attention, concentration, clarity and memory for those looking to naturally and safely enhance their cognitive performance in the gym, in the field, when competing, on the job, in the classroom– in life, and for those looking to maximize and unleash their full potential through an all natural supplement that works in tandem with and supports a healthy lifestyle. It is an all-natural supplement of high-potency ingredients that work together to boost mental focus, attention, clarity and memory and promote long-term brain health. With no additives, stimulants or preservatives, it comes in an easy to swallow and digest capsule that contains a unique combination of thoroughly researched and carefully selected nutritional supplements, antioxidants and essential vitamins to create a balanced and highly effective daily supplement to enhance mental vigor and vitality. RECOMMENDED USE: As a dietary supplement, take 2 capsules daily. Can be taken with or without food. This unique formula when taken regularly may help to improve cognitive ability and enhance mental and physical endurance. Studies show increase in focus, alertness and improvement in reaction time. This natural product does not contain artificial additives or processing aids. WARNINGS: Do not use if tamper evident seal is missing or broken. Always consult with your physician before use. Discontinue use and contact your physician if any discomfort appears. Do not use if pregnant or nursing.